The weather has been typically Spring like lately, albeit a bit further along in the year that I’d expect. Despite it being the beginning of May, it feels far more like “in like a lion” weather and we are being treated to some torrential rain, winds and short spells of sun. With all this “woahjus” weather I’m craving childhood comfort food to warm me from the inside out. I’m also weaning the baby onto solids and my mother in law suggested that I make some milk pudding for the baby and I thought that would be a great idea. I found some tapioca in the press. I had always thought that it was a form of rice but it is actually made from cassava root and so gluten free and very easy on the stomach. I suppose I thought it was rice because it was cooked into a milk pudding in the same way as rice was in our household. Tapioca is fondly called “frogspawn” in our household, I know not the most appetising of terms but it’s because of its appearance and texture when cooked. Basically I had made the tapioca on the Tuesday evening and put it in a small ramekin on top of some summer berries that I always keep in the freezer, then left it to chill. During the summer I stock it from foraging and the plot but during the winter I buy bags of frozen Irish fruit which is actually quite good value. While making the tapioca pudding I nearly burnt the house down when a gas canister I was using to try and brúlée the top of the ramekin failed. It turns out that the rubber ring which should sit between the nozzle area and the top of the canister was cracked and so it didn’t direct the gas to the nozzle as it should have done. I’ve learnt my lesson & won’t be using a gas canister in the house again. Pour both the milk and tapioca into the large saucepan at the same time. Place on a hob on the lowest heat possible. Heat the milk gently. Do not use high heat. Stir constantly but slowly, this prevents the tapioca from sticking to the bottom of the saucepan. As the milk heats the tapioca will begin to cook and stick together. Keep on stirring. The milk should reach a simmer temperature. Keep on stirring. The tapioca is cooked when the milk has been simmering for 5 minutes. Remove from the heat and add the vanilla extract, then sugar to taste. Traditionally served in our house with minimal sugar but a large dollop of jam instead. I did make semolina pudding yesterday for the baby as it’s less lumpy and he is still too young for lumps. 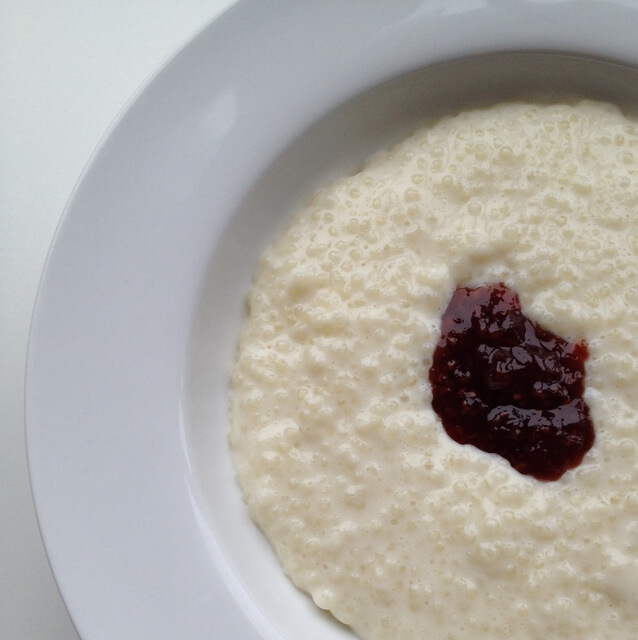 Exchange the quantities of tapioca for semolina. Please note, this blogpost was edited in June 2012: This post originally was very wordy so I’ve edited to make it easier to read & more concentrated on the recipe. Oh my Lord…. I’m in a panic just reading it! My 9 year old nominated herself as the Fire Safety Officer at Hunters Lodge and insists on regular reviews of our fire plan. No bad thing! So glad you are all okay. Glad to hear it Fiona. Great to have a plan. Thanks Colette. From chatting to people since you’d be surprised how many neglect such important things though. Wowsers Catriona, that is some story! Thank God you are all alright (fragile mental state after the shock aside!) I’m terrified of blowtorches after hearing a few similar stories about them. Milk pudding looks delicious, my mam used to make them for us as children although I haven’t tasted one in years. Must try your recipe. Mam used to make ours in a double-broiler but if you keep the heat low it is just the same. Only problem is you have to keep on stirring. I won’t have one in the house again. Oh my God! That’s so scary Caitriona. It can happen so easily. We had a very small fire just before Christmas, when I plugged in a tall lamp in our hallway (the lamp had been re-homed there from the sitting room to make room for the Christmas tree). Less than a minute later the smoke alarm was going off and thick black smoke and flames were billowing from the top of the lamp. I panicked, and instead of taking it out the front door which I was right beside, I rushed it through the sitting room and out the patio doors. Turned out my husband had thrown his knitted hat on top of it, and the halogen bulb had set fire to it… It scared me how quickly it happened. Halogen bulbs can get very hot alright. I can see why you went straight for the back door. It can happen in the blink of an eye. Oh my god! I can’t bear thinking what could have happened! Glad you are ok. Terrifying! No, it really doesn’t. Thank Peggy.